Taj Mahal is a beautiful white marble specimen of architectural art located in Agra built by Shah Jahan in the memory of his beloved wife Mumtaz Mahal after her death. Taj Mahal is also regarded as symbol of love and so many tourist visit this place every year from different corners. 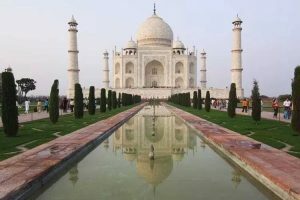 Below are few essay’s telling about Taj Mahal. Taj Mahal is a most famous historical monument and also one of the seven wonders of the World. It is situated at south bank of Yamuna River in Agra, Uttar Pradesh. It was built by great emperor Shah Jahan for his wife Mumtaz Mahal after her death. On the death of Mumtaz Mahal, firstly her remains were buried in Burhanpur and later her remains were temporarily reburied in a garden on the Bank of Yamuna river and finally the remains were buried in Taj Mahal. After death of Shah Jahan he was also buried besides empress Mumtaz Mahal. Later It was announced as the seven wonder of the World. It is build up with white marble and it beautifully shine in moonlight. Thousands of visitors visit Agra every year to see the beauty of Taj Mahal. It was built by the hard works of many artists, and workers. It took twenty two years to get completed and around twenty crores rupees were used to built this symbol of love. Taj Mahal have also been marked as a UNESCO World Heritage Site. It’s walls are beautifully decorated with multi-coloured gem-stones. The Quran’s couplets are written on its walls. The Taj is situated on a high platform. The graves of the King and the Queen are under the dome in a dark chamber. Taj Mahal was built by emperor Shah Jahan, who was the grandson of Akbar the great. As the history goes it was built in the memory of his beloved wife Arjumand Bano Begum better known as Mumtaz Mahal. Emperor Shah Jahan was deeply in sorrow after death of his most loving wife and decided to build Taj Mahal as a gift to her. Taj Mahal was a tribute by Shah Jahan to his wife Mumtaz Mahal. As it is always said that it is easy to make promises but it takes a lot to keep it, similarly the promise made by Shah Jahan took a lot to get completed. It took about 22 years to build this fascinating monument. Shah Jahan has called artisans and craftsman from different places on earth. Superb elegance, brilliant decor and exclusive designs are the factor which were considered during the making of Taj Mahal. As a result of which in the present scenario Taj Mahal is famed worldwide as an epitome of love. This most outstanding monument built by emperor Shah Jahan is located at Agra, Uttar Pradesh and situated on bank of Yamuna river. It is made of pure white marbles that shines in dark. As a monument of love “it is unsure- passed in the World.” It stand on a platform of 8.5 meters height. The mausoleum stands to a height of 32.4 meters. It is surrounded by cupolas at each corner. The bulbous dome in the centre of cupolas looks like an inverted lotus. There are four smaller domes at the four corners of the building. Four minarets stand at each corner of the terrace. The outer walls and the interior walls are richly decorated with calligraphy. It is an spectacular example of Mughal Architecture and also considered as the seventh wonders of World. Taj Mahal- There is no other monument in the World which can match the beauty of Taj Mahal. It is located at Agra city in Uttar Pradesh state. The Taj Mahal is one of the most beautiful masterpieces of architecture in the World. Situated at the bank of river Yamuna about 200 km south of New Delhi. Shah Jahan has three wives and Mumtaz Mahal was one of the most loved queen of Shah jahan. Mumtaz Mahal was a niece of Nur Jahan and grand daughter of Mirza ghias Beg I’timad-ud-Daulha, who was the wazir of emperor Jahangir. Mumtaz Mahal was born in 1593 and died in 1631 at the age of 38 she died after giving birth to their fourteenth child in Burhangur. Emperor Shah Jahan was in deep sorrow at her death and decided to build Taj Mahal in her remembrances. Soon after her death her mortal remains were buried in the garden of Zainabad. After six month her remains were shifted to Agra and was finally enshrined in the crypt of the tomb of the Taj Mahal. After the death of Shah Jahan his remains were also enshrined beside the queen’s in the Taj Mahal. Therefore, it is known as the mausoleum of both Mumtaz Mahal and Shah Jahan. Taj Mahal is Built in white marble by a grief stricken emperor Shah Jahan. The Taj Mahal is memorial to his beloved wife Mumtaz Mahal. It took twenty years to get completed and emperor has spend a huge amount to build this beautiful building. Taj Mahal has been constructed by combining different architecture styles including Indian, Chinese, Persian, Islamic and Turkish. Taj Mahal has four beautiful pillars in its corners which have been designed slightly inclined outward to prevent this beautiful building from any natural calamities in the future. In 1983 It has been declared by the UNESCO as one of the UNESCO World Heritage Sites. It has attained a worldwide popularity. The Taj Mahal is one of the most amazing tourists destinations in India and is also considered as the one of greatest seven wonders of the World. Most of the India seek tourist in the world is at Taj Mahal. Nothing in the World can beat the magical effect of the Taj Mahal. The environment surrounding the Taj Mahal is so attractive and the trees around enhance the beauty of this palace. There are also amazing water fountains set up in the middle that make the entry to this great mausoleum more beautiful. Tourists who never set foot in India dream to be here one day and tourists who have been here know what haunting beauty is. Worldwide admired as a symbol of love and beauty this beautiful Mausoleum is like a dream woven in marbles on a star studded night. Build by Shah Jahan for his lady love and wife Mumtaz Mahal the monument tells a story of Love and mystery. This architectural marvel was constructed in marble and precious stones which were imported from china and Italy. A mere 4 hours drive from Delhi will take you to Agra. If you are venturing on a tour to Taj Mahal you must include Agra Fort, Itimad- ud- Daulah’s tomb, China ka Rauza and Sikandra as well to get an overall knowledge of Mughal architecture and Era.